Chester FC Mini Kickers returns for the new season in September with spaces available for children aged 3-7 to join these fun football sessions. Mini Kickers is a brilliant introduction to the beautiful game for youngsters in a fun, safe environment with all abilities and experience levels welcome. Each session features activities and games with Chester FC Community Trust coaches designed to develop football specific skills and fundamental movements while helping to develop important life skills and values such as communication, teamwork and respect. 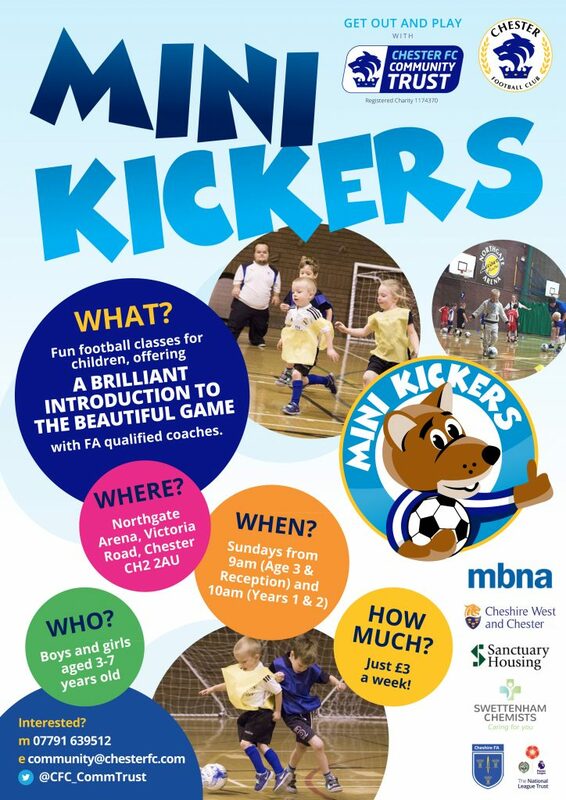 Mini Kickers takes place on Sunday mornings in the sports hall at the Northgate Arena with two classes: 9am for three-year-olds and children in Reception; and 10am for children in Years 1 & 2. Classes cost just £3 per week and there are no joining fees or advance payments, however new starters are asked to arrive 15 minutes before the start time to register. Mini Kickers restarts on Sunday 9th September and sessions run during term-time only. For further details or to pre-book places, email community@chesterfc.com or contact 07512 355396. A new publication promoting the work of Chester FC Community Trust along with the news and information from Chester FC has been launched. Blues Briefing is a tabloid-style newsletter that will be distributed free across Chester, Cheshire West and Deeside to raise awareness of the club’s charitable trust and improve engagement with supporters and the wider community. The first issue is out now with 10,000 copies ready to be given to shops, businesses, leisure facilities and community venues, as well as being delivered door-to-door in some areas. The Community Trust, which delivers a range of initiatives under the themes of coaching, education, health and inclusion, hopes to publish Blues Briefing every three to four months with local companies able to support its distribution through advertising. Jim Green, chief executive of Chester FC Community Trust, said: “The launch of Blues Briefing is an exciting step forward as we look to raise our profile as a charity and the impact our work has on the local community. “As a supporter-owned club, Chester FC is about so much more than what happens on the football pitch and Blues Briefing will help us to illustrate that. You can download a digital version of issue one of Blues Briefing now here. 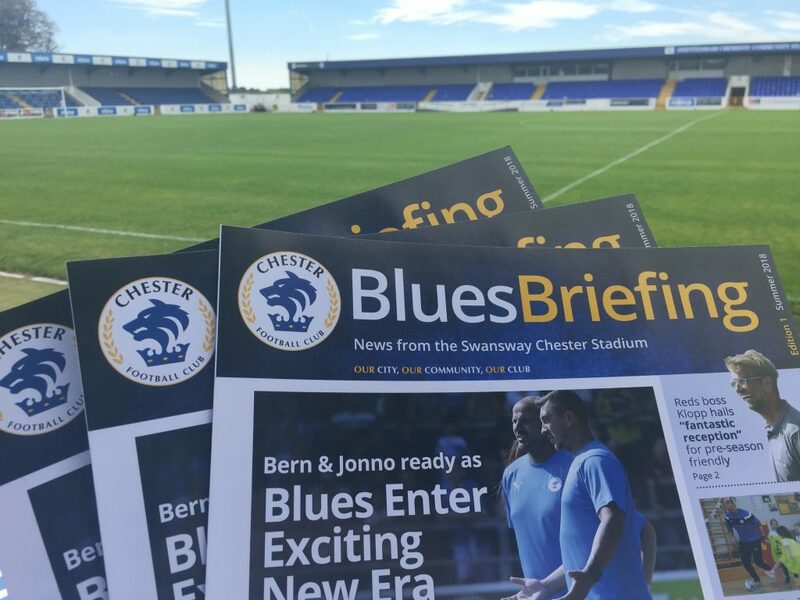 Businesses and premises who wish to receive copies of Blues Briefing for customers and visitors can email community@chesterfc.com to arrange distribution. Supporters interested in becoming part of the team of volunteer distributors to deliver Blues Briefing in their area can contact the club on 01244 371376 or email community@chesterfc.com. Companies who would like to know more about opportunities to advertise in future issues of Blues Briefing can contact Jim Green on 01244 371376 or email jim.green@chesterfc.com.